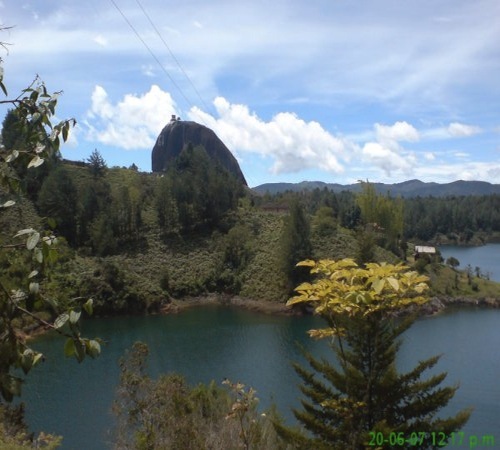 This beautiful place is located in the department of Antioquia, about 90 minutes from the city of Medellin, my hometown. The reservoir is one of the largest in South America. It is used to practice aquatic sports. 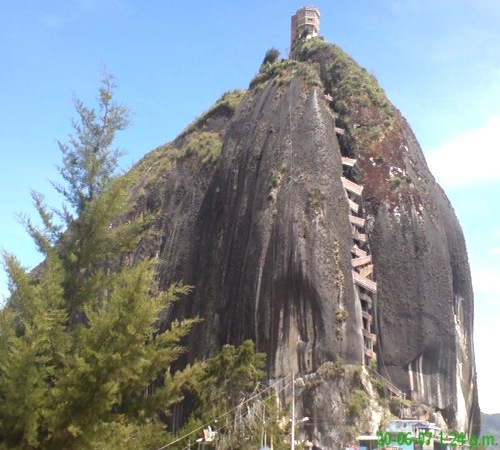 The rock is known as The Peñon of Guatapé or La Piedra del Peñol, it has 644 steps and the view from the top is absolutely amazing. At the base on the rock you will find restaurants and stores. 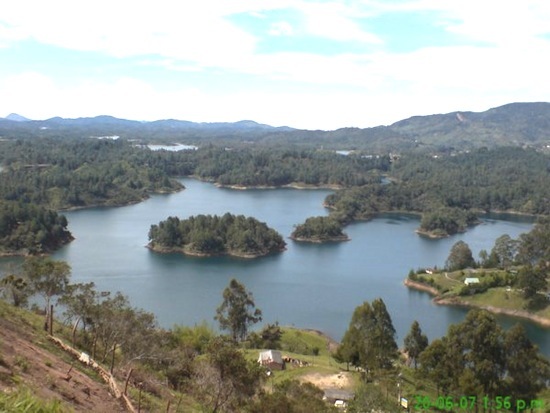 This is a popular tourist destination in Antioquia-Colombia. The pictures are courtesy of my cousin Maribel, who lives in Italy with her husband. When they visit Colombia together, she takes pictures and shows him all the beauty of our country. Now he loves going there on vacation! Very beautiful country! Thanks for sharing it with us! What beautiful pictures Erica! Everything looks so lush and vivid. Thanks so much for sharing! 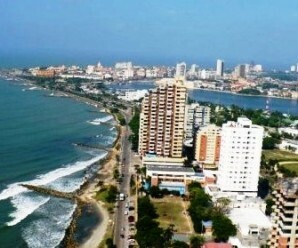 I love el peñol!! 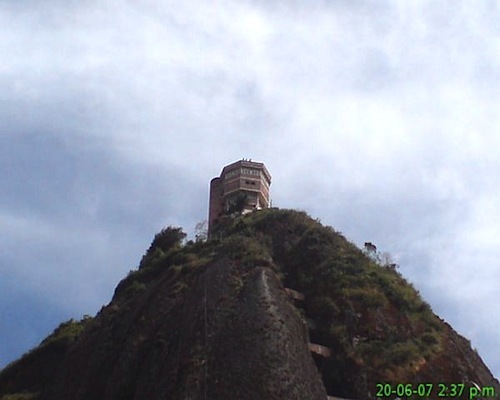 I went there as a girl many times, but was never brave enough to clime all the way up inside the rock. Que lindo, me gustaria conocerlo algun dia! you sure belong to a very very beautiful place. I dream to taking vacations whenever I see such pictures and if life permits I will have my dream come true some day. This has made my day! Such a beautiful place! I will dream of visiting there! Wow! This is so beautiful Erica…Would love to visit it some day!!!! Oh my goodness, what beautiful pictures, thanks so much for sharing. When we finally make it to Columbia – this is on my list of places to see! Thanks for showing this beauty of your homeland. Her father is Lebanese, but her mother is Colombian. Taste of Beirut- Yes. I knew Shakira has Lebanese genes! I love her….She is my one of my favorite singers. 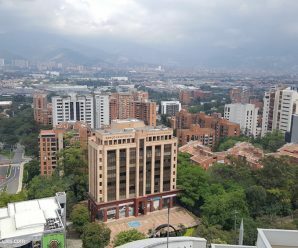 I just discovered your blog and love it…these pictures make me “homesick” as I lived in Medellin for 2 years and simply fell in love with the area…beautiful photos! 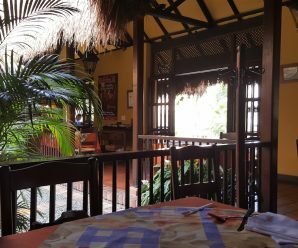 Hi Erica, I have been enjoying looking at your,your photos, recipes, reading about Colombia . I have seen some of these places. Someday I would love to go back. I grew up with an American mother with Italian decent and a Colombian father, who came to the US. when he was 30years old. So my mother would try to creat some of the dishes my father liked, Masamora (I never liked this), Sancocho, and Paella. My mother has since died and I would like to make some recipes that maybe my Colombian grandmother might have made. All of my fathers family still live in Colombia, however, they feel it would be too dangerous to visit them. 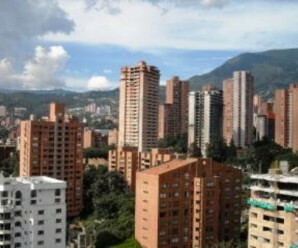 I remember as a child and the last time, when I was in college, seeing Cali, Bogata and Medellin. Driving up into the mountains to see the finca house that my cousins had. One of my favorite memories is of my grandmothers Empanadas with aji. I have never tasted any as good as hers were. I am going to try to make your recipe of empanadas, maybe my children can enjoy something from a part of their Colombian heritage. Thank you for giving me some knowledge so that I may fulfill that dream. 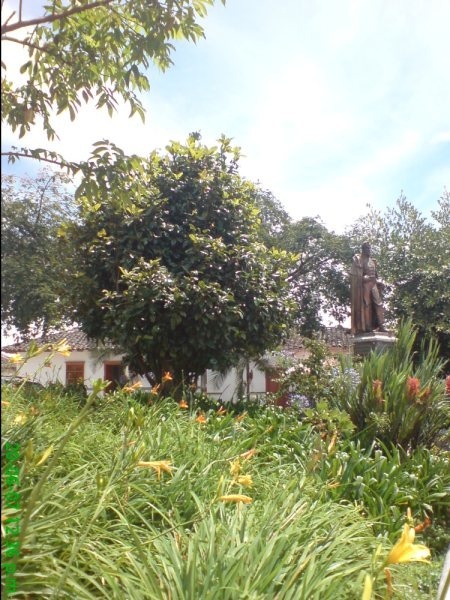 Don’t be afraid of going to Colombia is a beatiful place and people are very friendly, I was born in colombia and move to the us with my husband who is american we are planing a trip to Colombia and we are going to visit la piedra del penol, I can’t wait I am so homesick special during this time of the year. I also want my children to learn and love my culture.